I think that at this point most of us can agree that sales force automation software is in high-demand. This report, executed by Software Advice, reinforces the fact that more and more SMBs are searching for ways to organize and manage their contacts. The methods that were once the norm (pen and paper, spreadsheets, a rolodex, etc) are becoming obsolete as the competition becomes stiffer, and the sales process has become more customer-centric. Who wants to have to manually track all of that data, right? Of course, I am happy to see this trend towards CRM and marketing automation software. It does not surprise me that, of the surveyed businesses, the majority of businesses searching for a CRM for the first time were small businesses with less than 20 employees. Larger companies have the monetary resources, as well as the implementation staff, making it easier to succeed with CRM. Now, as more and more CRM vendors saturate the market, businesses are becoming more educated on the topic and therefore more inclined to start searching for a solution that might work for them. In the past, sales force automation software was expensive and complex, making the idea of investing in one pretty unattractive to smaller companies with limited budgets and staffing. As more vendors enter into the market, the more available and affordable they become for any-sized business. This is the reason that the CRM industry is booming. As people become more educated, the more they are going to want to implement CRM into their strategy. CRM is critical for organization, productivity and efficiency. The more contacts you have, the more important it becomes. CRM allows you to collect and organize so much data enabling you to develop stronger and longer-lasting relationships with leads and customers than ever before. A recent article by Erika Morphy in CRM Buyer explains this CRM boom in more detail. The one thing that surprised me were the features that businesses noted as most important. I was a little shocked to find out that more small businesses were not searching for marketing automation. Marketing automation, website tracking, surveys, social media integration, etc are all valuable places to gain important insight into your leads and customers. Marketing automation is the next step in saving both time and money. 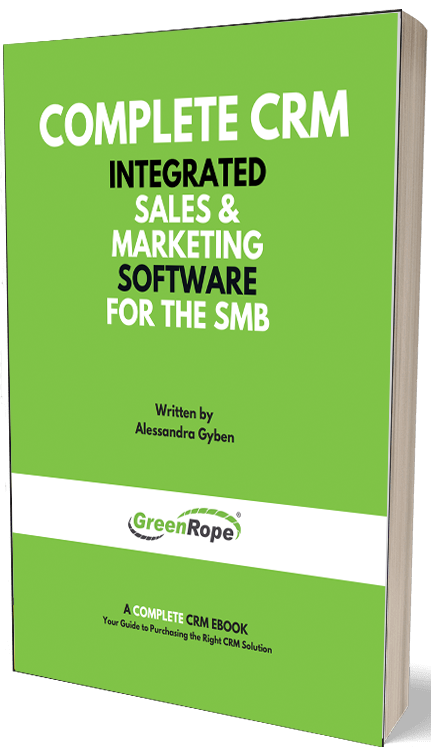 I do understand that marketing automation tools tend to be quite pricey, however there are tools, such as GreenRope, that offer both CRM and marketing automation. I do not think that it is wise to jump in all at once, but it is important to have an integrated suite of tools, so that when a business is ready, they have the features available to start implementing automated processes into their strategy. Integrating a third-party software with your CRM can oftentimes result in data loss, and may take a lot of time and effort to implement after the fact. All-in-all, I think this a great report showing positive trends towards CRM adoption. To view the full report, click here.